'Golden Celebration' ™ (Ausgold) bred by David Austin is a delightful variety in their English Rose Collection. It is one of the largest-flowered and most magnificent of the English Roses. Its colour is rich golden yellow and the flowers are in the form of a giant, full-petalled cup. It has excellent shapely growth, forming a nicely rounded, slightly arching shrub with ample foliage. It is very reliable and easy to grow. It is an ideal rose to mark any celebration or important event. The flowers are initially tea-scented but often develop a wonderful combination of sauterne wine and strawberry. It features repeat flowering and will benefit from summer pruning in most areas. This variety won the best shrub and most fragrant rose awards at the Rose Awards Day 2000. If you take part in the meme, please show an active link back to this site on your own blog post! Love David Austin roses, but can't easily grow them here :-( Nice to see one on your page! This is my favorite rose. And your photos is really lovely too. Am very fond of yellow roses, so I painted a 24 x 24 inch one:) Thanks for hosting and for your note about a possible meme. How fun that you posted all roses. I have been looking at roses myself considering where to plant them. I saw some David Austin roses that I like but they don't tell you what zone they are for.... I want roses that smell nice too. I am tired of non fragrant roses. Love the shape- I am a big fan of old-style roses with a beautiful fragrance. Oohh .. the roses smell really wonderful. I know these. And this color.. beautiful! I like the sunny color - do the smell like they look? Have a good weeekend and thank you for hosting. The name is pefekt and the pic is lovely. 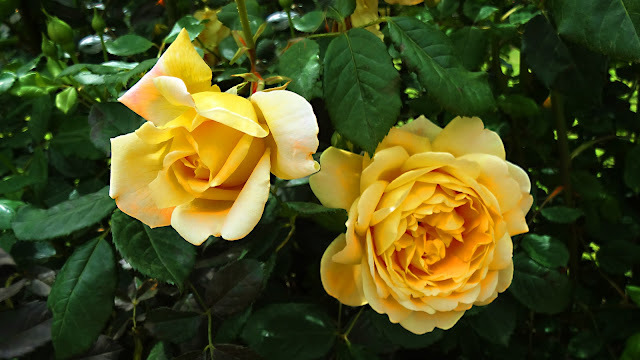 a marvelous photos of this yellow roses. Amazing ! Nick, sauterne and strawberry - interesting combination. Thanks for sharing. Very pretty petals! They must fill even cloudy days with sunshine. One of my favorite one!! Happy Sunday, Nick!